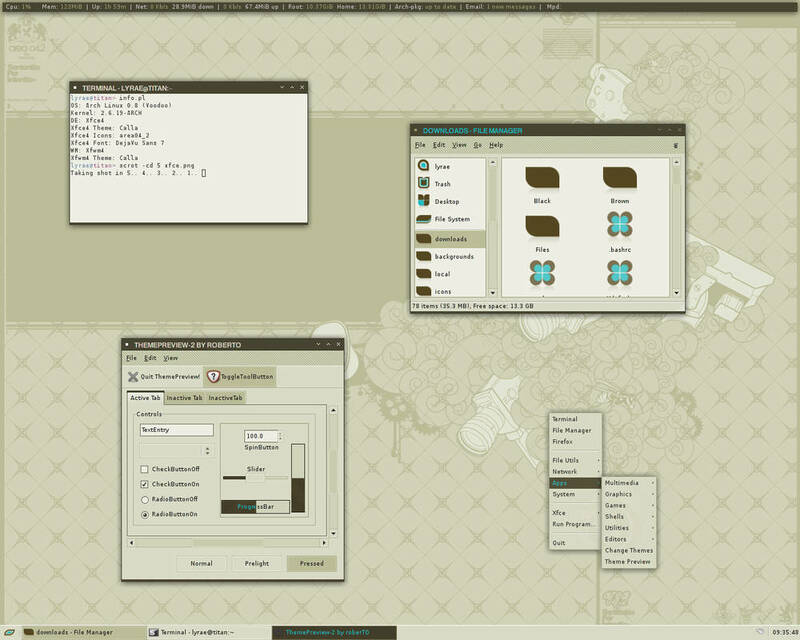 Also included a metacity, xfce and emerald themes. 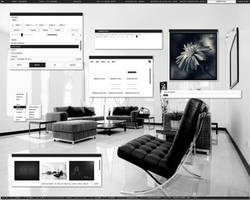 You will need a Rezlooks Engine and Pixmap Engine. Icons are called Area04_2 by heylove. Changed scrollbar color and added arrows. Looks greats I was trying to help someone install this on ubuntu and I thought I'd leave the instructions here if someone needed them. - Right-click on the file and select "Extract here". Open the folder that will show up. 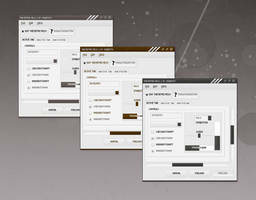 - Open System > Preferences > Appearance. 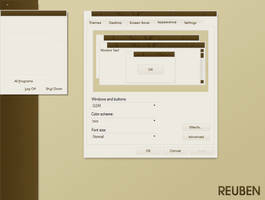 Drag the folder "Calla" to the themes tab and click to apply. If it complains about "moving directory over blah blah". 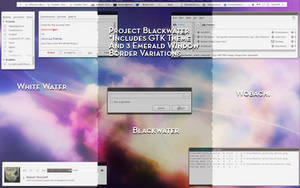 Open the home folder, press Ctrl + H and open ".themes", delete the "Calla" folder and try dragging the folder to themes again. 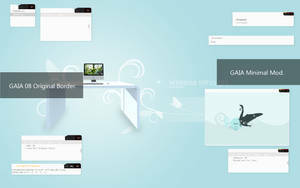 - Click customize, select "Window Border" and choose "Calla". Well that's it. Couldn't find the pixmap engine but things still look good without it, I think! how did you make the letters all capitalized? Ooh this is really stylish I like the colors. What firefox theme do you use with this? 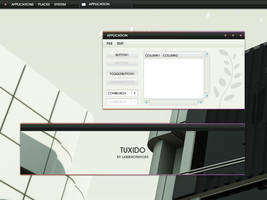 For most themes, I used the default and since I can't remember which themes I used, I think it is the default. What fonts are you using in the screenshot? (If you can remember) Also, does one get all caps in the window title bars? 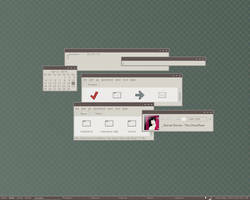 As for icons, I got ahold of the .ico files, but I'm not sure how to implement them in gnome. I know I have to convert them into .png's, but what do I do from there? As shown in my terminal, it is DejaVu Sans. 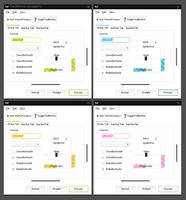 The caps font is Avantgarde LT Medium in the window titlebars. 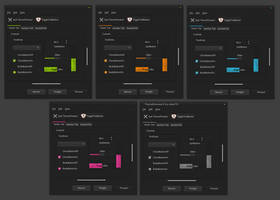 As for icons, have a look at this [link] or you can get mine if you like although it is not completed. Thanks! Hope your dad will let you try linux. Hi again, I just wanted to let you know why this theme doesn't work that well in ubuntu. 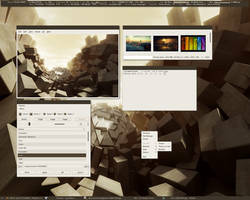 This theme doesn't run under gtk2-pixbuf-engine, like someone previous stated. It needs rezlook, but when installing rezlook with either the .deb or compiled from source, it puts the engine inside /usr/lib/gtk-2.0/2.4.0 where your theme doesn't find it. The easy solution is just install the engine with the .deb and then copy the 2 files to /usr/lib/gtk-2.0/2.10.0. 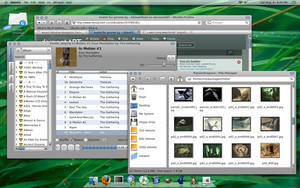 Thanks again, it's a great theme and I'm using it inside OpenBox together with the Fawn windec. Hehe yeah I'm glad to cause this really is the perfect theme for me. I really hate all those vistaish or macish style and effects everybody seems to be using now a days, this feels more Linux somehow . 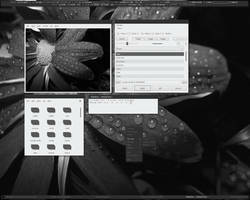 I just wanted to let you know why this didn't work that well with ubuntus rezlook, cause I saw some people ask about that in both this and the thread on gnome-look. Thanks again and I hope you continue themeing, cause you really are on of the best out there. Btw I just wanted to make myself clear. I love both your Fawn and Nova themes, it's just that this one might be the most beautiful themes around since...erm...Amiga OS . Actually are you sure those 2 engines are all you need with a *buntu install? I have gtk2-engines-pixbuf and gtk-engines-pixmap installed and i also installed gtk2-engines rezlook from source and still your theme comes up rather ugly in XFCE. 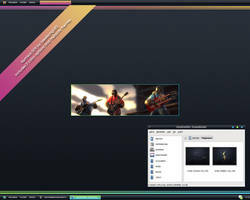 Well well, your Nova and Fawn themes have to work but this one is a real beauty. Yes. Strange that it doesn't work. Are you sure you are using the latest version of these rezlook-engine? Yeah, I took it down and compiled them. 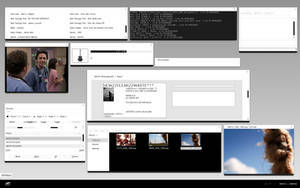 It's not a big problem though, cause I'm hardly ever inside xfce I'm a OpenBox kind of guy . Thanks for all you beautiful themes. Hey, I can't find a download for the pixmap engine, do you know anywhere I can find it? 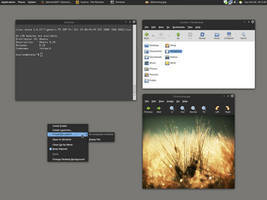 gtk2-engines-pixbuf and gtk-engines-pixmap are the names you need to install if you are using ubuntu. That is all I know. awesome theme... I'm just wondering how to get the kind of right-click menu you have? 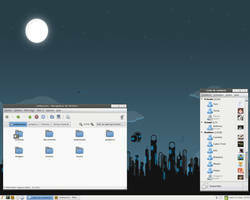 Thanks The right-click is just plain xfce menu but without the icons. Looks really cool ! good job ! please how can i install this skin in Fedora 6? 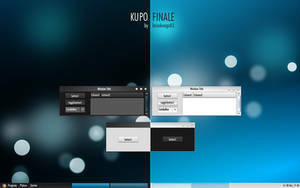 gtk2-engines-pixbuf and gtk-engines-pixmap are the files that you need to install. I'm not sure if it is the same in Fedora 6? Just put the theme in /home/yourname/themes folder. Sorry, I made a mistake. 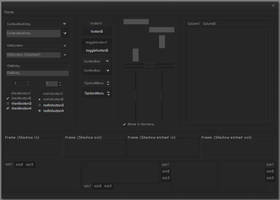 Put the theme in /home/yourname/.themes folder. Awesome theme. Too bad it keeps wrecking the OOo-Writer. Do you have any idea why this could be? I thought it had been solved. Did you use the latest version? It should have fix the problem. Yes, alright. The last version solved the issue. 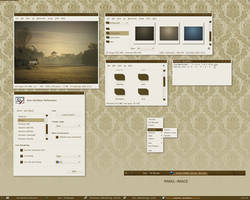 really cool, cna you send me the config of conky ? Btw. I found this icon pack, is there an easy way to convert them to png? How did u get the top info bar ?